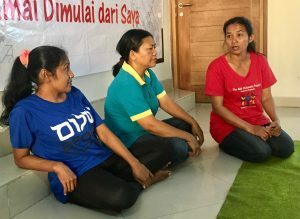 Last July while visiting our partners in Denpasar, Bali, I met three ladies who had been infected by HIV-AIDS through their husbands; they found themselves ostracized and with no way to care for themselves or their children. Together with Andy, we developed several initiatives to help these women and others like them to stand on their own feet while encouraging others to find dignity, freedom and peace. Some of those initiatives included cleaning motorcycles, laundry services, selling food and coffee, and even making and selling organic soaps. However, they were not able to find sustainable success in any of these. A couple of months ago, my colleague Andrew Jones (from New Zealand) introduced us to Nicole Voelkel (from USA). She is a fellow sojourner from everywhere. 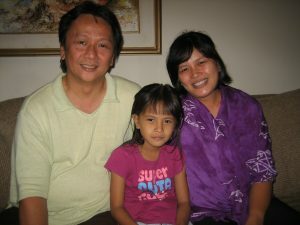 She is a Missional Fashion Designer and has worked in projects in Mexico, Mozambique, Colombia and will now partner with us in Bali. Nicole will be in Denpasar on December 10 and will invest a month to train the minds, hearts and spirits of the women of Gerasa. She will enhance their sewing skills and prepare them to sew her designs using local fabrics. Nicole will then sell their products in the USA and Europe, investing back into the ladies in Bali, empowering them to sustain their lifestyles and continue to serve others. The Gerasa sewing ladies… Iluh in blue; Putu Yudani in the middle and Juli in red. children and the work of Gerasa. Your gift is fully tax deductible (in the USA) and you will be helping sustain not only the ladies sewing but the entirety of the Gerasa community.